When we look at the future potential of BPO, one of the markets with the most untapped potential is that of supply chain services, which could be as large as $300 Billion in annual expenditure when today's emerging offerings really begin to mature, and an increasing number of buyers have to tap into third party technology and services specialization. 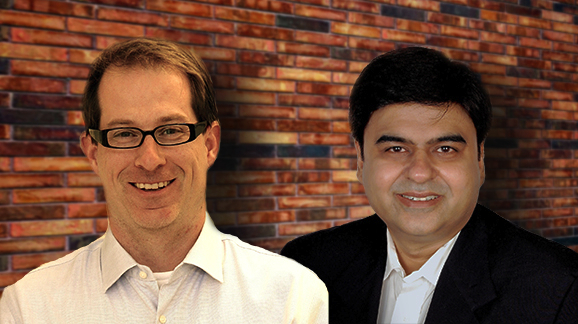 So, Charles and Pareekh, what is driving buyer interest in Supply Chain Management BPO today? For most enterprises the costs of goods sold is the vast majority of their income statement and the with SG&A having in many cases being squeezed extensively over the last decade they are looking for new ways to both reduce COGS but also to improve performance of their supply chains as well. As the world continues to globalize and both suppliers and customers become more distributed and more demanding it is strategically critical that enterprises rethink how they are managing these supply chains. It’s taken quite awhile for the message to get out to the broader market that there are a variety of different SCM BPO service providers today who all have valuable offerings to help with the enterprise supply chain but we see that market knowledge and understanding is taking hold. There are so many pain points for both multinational corporations and domestic SMBs in their supply chains including the lack of end to end visibility, lack of standardization in processes, rampant inefficiency in transactional processing, shortcoming in the scale of operations as well as the lack of resilience in their globally dispersed supply chain that when SCM BPO comes along and offers solutions to many or all of these it certainly helps create the level of increasing buyer interest that we are seeing today. How would you categorize the current state of this market? We would say that the SCM BPO market has two is defined by two key and in some ways conflicting traits. On one hand it is a very nascent market where the potential for impact in the enterprise and for revenue for Service Providers has barely been scratched. On the other hand, SCM BPO is one of the most advanced of all the BPO offerings in the market as it can combine business outcomes based contracting, deep analytics in delivery, collaborative partnership based solutions, large scale process transformation and the use of significant technology components as well. In fact we see SCM BPO as one of the best examples in practice of what we have been calling “progressive operations”. It really can be leading edge service delivery but as we said it’s still a small market, with relatively few RFPs and minimal involvement of sourcing advisors. Once it gets better known and the case studies from clients get more attention we believe that this is a market which will really take off in the next few years. And how did the Winners Circle shake out? - Deep reference examples of clients who have been through a journey of SCM transformation together with these service providers that they couldn’t have done on their own. So what are your key takeaways from this study? We think there are four key take aways from this Blueprint study on SCM BPO. First, is the uniqueness of SCM BPO by comparison to other horizontal BPOs. Second, it is about the market potential and relevance across industries of SCM BPO. Third, is the current heterogeneity of capabilities and strategies across the SCM BPO service providers profiled. Finally, it is about the capabilities required to be successful in the SCM BPO market today. 1) The SCM BPO market is unique as it impacts COGS (Cost of Goods Sold) while the other horizontal BPOs primarily impact SG&A. 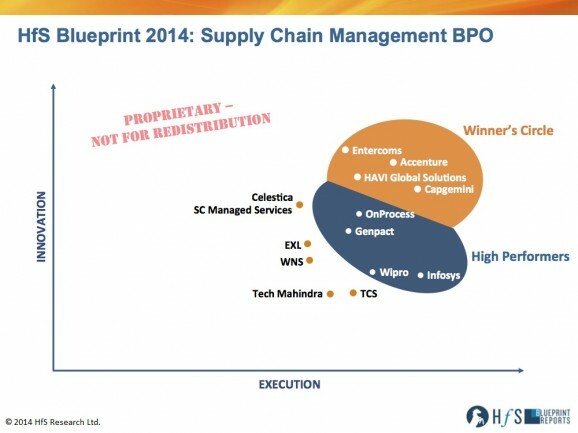 In SCM BPO, there is competition not only from the other SCM BPO service providers but also from diverse set of providers such as IT Firms, software firms, consulting companies, 3rd party logistic (3PL) firms, firms with integrated supply chains, reverse logistics and/or firms willing to carry inventory costs and infrastructure. In this mixed environment, it is the role of the SCM BPO providers to better defined the client problems and possible outcomes and then bring together an ecosystem of all these various components to create the solution. As a result, partnerships and partner management is of greater importance in this area of BPO than pretty much anywhere else we have looked. What also makes SCM BPO unique is that having a distributed geographic delivery footprint is not just about cost savings or follow the sun processing but a key part of delivering what in many cases are still very physical and localized processes. 2) Since SCM BPO directly impacts COGS it means that the potential addressable size of this market is even at conservative estimates huge, on the order of about $3 Trillion with a related process cost of say $300 Billion annually. Based on our current estimates of the market, BPO Service Providers are delivering perhaps $1.5 Billion in services so around 0.5% of total potential just in BPO and 0.05% of enterprise related cost. 3) Amongst the service providers we have profiled we see four different segment which creates this heterogeneity in approaches to the market. We see there being: consulting solution based service providers, specialist service providers, pure play BPO service providers and large IT services companies. Even within these segments we see significantly different areas of focus by service provider and strategies which at this nascent state of the market are unique to each. Therefore as a potential buyer of SCM BPO services, it is incumbent on you to look at all these different approaches and talk to the service providers to understand their vision for the processes and capabilities as this isn’t a market where you will see near identical bids across a range of service providers in response to any RFIs/RFPs you release. 4) If we have to pick one essential capability required to be successful in the SCM BPO market today it will be the availability of analytic based consulting capabilities on top of transactional service offerings. All of the service providers in our Winner's Circle have these capabilities. It is because of the collaborative, analytic based business outcomes oriented model for SCM BPO that we really see this as one of the clearest expressions of what we have termed at HfS as “progressive operations”. SCM BPO really can be one of the offerings that sets the path for the other parts of the BPO marketplace to follow. What are some trends you are seeing in SCM BPO offerings and what should we be watching for in next few years? The biggest trend is SCM BPO service providers acting as collectors and commentators on the vast variety and volume of supply chain related data that is being created. BPO Service Providers are using this data in two different ways today. First, they are using the data in near real-time to identify weak links or problem areas in the supply chain by implementing visibility platforms, dashboards and Control Towers and wrapping those with insightful analytical teams. Second, they are using the data with consulting and process excellence teams on a project basis to drive better decision making outside of the real-time interactions. Going forward we should be watching for even more rapid growth in the volume and variety of this data as it gets fed by even larger and more detailed streams from telematics, machine to machine interactions (M2M) the internet of things(IoT) and by social media commentary from users of the products in the supply chain. SCM BPO can be a capability to not just analyze the data and drive better discrete decision making in the process but as it integrates with product development, it can be at the intersection of value creation as we bring together the product development cycle with insight from product performance in the field, reliability data and insight from the operation of after market services processes. This is one dynamic area and we want to show how this is evolving by also looking at the inter-related engineering services market later in 2014. Over the next few years, we believe that SCM BPO will be one of the fastest growing and ultimately largest markets in BPO and as that happens and more service providers develop their offerings in this space we should expect to see a lot more M&A activity as the race to scale and differentiated capabilities takes root. Thanks for taking the time to learn more about SCM BPO and we look forward to more of our continued coverage on this evolving market in the coming months. Supply chain services will be corner stone of BPO in the coming years. That is for the sure.